CONCORDIA COLLEGE. Freshman from the class of 2022 participate in the beanie toss on Olin Hill. 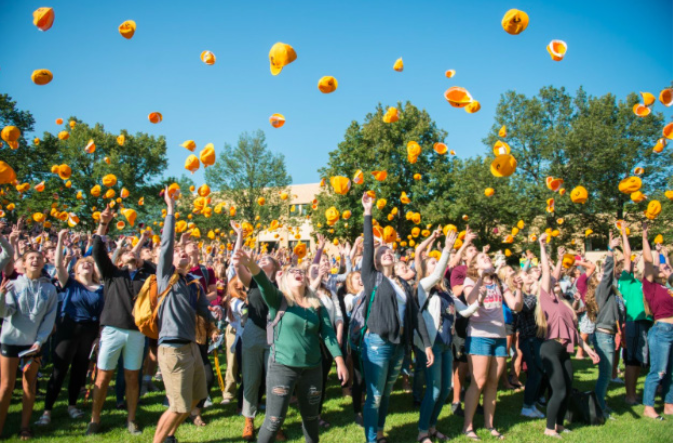 This fall, Concordia welcomed 597 new Cobbers, which is the largest freshman class since 2013. Concordia’s reputation for having prestigious academic programs, rich history, a strong sense of community and a beautiful campus are only a few of the reasons why nearly 600 freshmen hailing from far and wide decided to call Concordia their home for the next four years. AJ Jennissen, a freshman from Mantorville, Minnesota who is majoring in mathematics and computer science, shared similar reasons for attending Concordia. “I chose Concordia because it felt very welcoming, the faculty were more helpful here than any of the other colleges that I visited and it has a great academic reputation,” he said. Ada and AJ both mentioned how Concordia’s faculty played a large part in their final college decision. Brandon Wente, Associate Director of Admission at Concordia, shared that this is one of the hallmarks of Concordia’s admission process. “Professors, staff, coaches, conductors – everyone has a hand in meeting with and impacting prospective students,” he said. The tireless efforts from faculty and staff have proven to be successful based solely on the size of the current freshman class, but this achievement doesn’t stop them from continually striving to enhance and innovate all facets of campus. As Concordia constantly aims to improve and grow, one of the college’s main focuses has been its diversity initiative. According to the Concordia College website, it aspires “to be a diverse community that affirms an abundance of identities, experiences, and perspectives in order to imagine, examine, and implement possibilities for individual and communal thriving.” The initiative has translated well into this year’s freshman class. “14.5 percent of this incoming class are students of color, which is about double in comparison to some of the previous years. I hope that this is the beginning to a similar uphill trend along with those enrollment numbers,” Wente said. The number of international students has also been on the rise since Wente started working in Concordia admissions six years ago. The freshman class has 26 international students, all of whom have traveled thousands of miles to attend Concordia. As for the rest of the class, 72 percent are from Minnesota, while the other 28 percent come from elsewhere in the U.S., including North Dakota, South Dakota, and Wisconsin, which is consistent with previous years. Academically speaking, this freshman class is also comparable to previous years. The average ACT score for this class is 24.4, and the average high school GPA is 3.51. The most popular majors among the freshman class are Business, Nursing, Music, Pre-Medical, Biology, Psychology, and Education, which align with some of the most common majors across campus. Deciding majors, touring campuses, and trying to find the perfect college are all no easy feat, and Mike Vandenberg, Director of Recruitment at Concordia, agrees. While the admissions department does a lot of the “heavy lifting,” as Vandenberg puts it, when it comes to recruiting students and persuading them to come to Concordia, they cannot take all of the credit for the 597 freshmen who decided to attend Concordia this year. “The truest testament to us being able to make the number [of students] that we made this year is because of the folks we have working on the campus. It’s hard to have a class if you don’t have the whole campus working to build that class,” Vandenberg said. Concordia’s dedication to students doesn’t stop after a student is admitted. Faculty and staff continue to zealously support and connect with students throughout their time at Concordia, so it can be assured that these new Cobbers are in great hands. Best of luck to the Concordia Class of 2022!